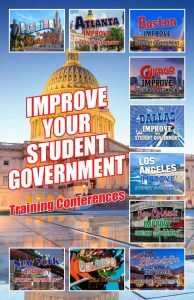 You will learn how to improve your Student Government. ASGA is the only organization in the nation that totally focuses on Student Government training, research, and consulting. We’re totally in touch with SG trends and issues nationwide. We produce 11 training conferences, many of which are over a weekend, so you won’t miss school. Thousands of student leaders and advisors get training for their Student Governments each year at ASGA conferences. All types and sizes of colleges and universities are welcome. Which conference is best for me? What makes ASGA conferences the best in the nation? If you’ve never been to an ASGA conference before, now is the time!